Preview: Launch Pad: Th-th-th-that’s all folks! Artists: Jamie Fitzpatrick, Maria Gondek, Amy Kim Grogan, Alfie Kungu, Millie Layton, James Lomax, Milly Peck, and Dominic Watson. Join us for the preview of our first Launch Pad of 2018 Castlefield Gallery presents Th-th-th-that’s all folks! curated by Manchester-based collective Rhino. Guest judge Poppy Bowers, Exhibitions Curator at the Whitworth (Manchester) and Castlefield Gallery’s Curator Matthew Pendergast selected Th-th-th-thats all folks! from CG Associate members’ submissions. Rhino is Emily Chapman, Liam Fallon, Tulani Hlalo (CG Associate member and Castlefield Gallery 2017-18 Manchester School of Art Graduate Mentee) and Meghan Smith. Th-th-th-that’s all folks! 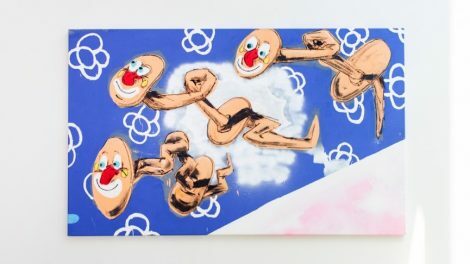 features work by artists based across the UK, including Glasgow, Birmingham and London, a number of whom are exhibiting in Manchester for the first time. Working with video, sculpture and painting, the artists selected by Rhino share a particular sense of humour, part expression of and part refusal to be determined by the current socio-political climate, and accompanying the exhibition will be two texts- one by a 23-year-old and one written by a 6-year-old. Launch Pad: Th-th-th-that’s all folks!